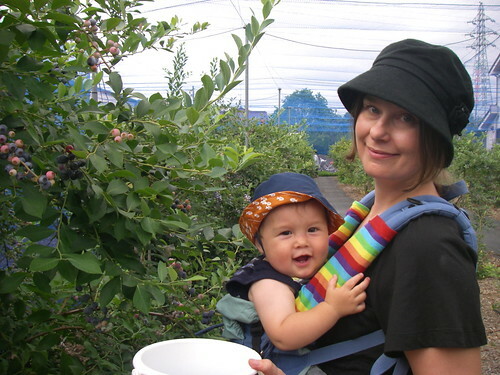 A few Saturdays back we took Shuma for his first fruit-picking excursion (also our first in Japan). He's ten months old now, and that might seem a little young to be putting him to work, but we believe it's time he started earning his keep. 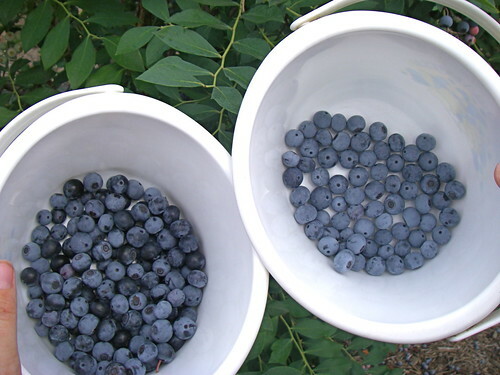 For years now we've been noticing little blueberry patches here and there in our area but never seemed to find the time to go picking during the short season. I've also seen the berries themselves on sale at the local JA (Japan Agriculture, the national farmer's co-op) store and at little honour-system roadside stands, but balked at the price: 600 yen for a tiny 200 gram package. Outrageous! And then this year at the JA there were posters and brochures for Nerima-ku blueberries. Nerima is the ku, or ward, that we live in, and was famed for its daikon in the Edo era, and is recently known for producing the most cabbages of any ward or city in Tokyo. Not exactly exciting stuff, so apparently the ward is trying to re-brand itself with blueberries. 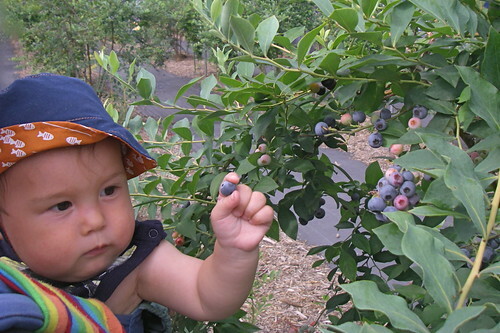 There are now 25 blueberry farms (orchards?) spread throughout the ward, mostly concentrated in the west end. And aside from selling the berries at JA shops and farm stands, each farm is open on certain days of the week for picking, at the price of 200 yen per 100 grams. Still pretty outrageous but cheaper than buying them already picked and possibly cheaper than imported berries. And after trying it for ourselves, it's totally worth the money when you factor in the entertainment value and the fact that they are a million times more delicious when freshly picked. The brochure is unfortunately only available in PDF format, page by page (scroll down and click the page with 7 and 8, which shows the farms nearest to us- we picked at number 7, Konishien). But it's nicely down, with lots of information about blueberries and maps of the farms including local sights. And this being Japan, Nerima blueberries have their own "image characters": Blueberry Kuma Sankyodai (The Three Blueberry Bear Siblings). Big Brother Bear is named Burun, he's cheerful and good at making jam; Little Sister Bear Rirun is a bit shy and loves fireworks; Little Brother Bear Berun is a mischevious glutton who loves climbing trees. So back to picking. All farms charge the same price, but they all vary on days and times they open (and I think you need a reservation to pick at each one). Some places provide plastic tubs, some ask you to bring your own; some farms have a 1 kilogram limit and some don't. At all farms it's strictly picking only, with no eating allowed (unlike traditional fruit picking in Japan, in which you a heavy entrance fee and eat everything as you pick it). But I did see plenty of other pickers eating, and we snuck a few too. Which doesn't seem like much, but knowing how much they cost we were trying not to go crazy. The other pickers, who were equally divided between families with kids and lone obaachans (grandmas) were totally filling their buckets, and probably paid two or three thousand yen for their takes. I can only guess they were making jam or giving them away to friends and family. We ended up with 400 grams, for which we paid 800 yen. My inner cheapskate protested, but it was fun and provided a week's worth of breakfasts for all three of us (especially Shuma, who is in a blueberry phase and will eat nothing else in the morning) and a few desserts. And they were really good, in that Japanese fruit way: very very sweet. I still prefer the more tart and intensely flavoured Canadian berries (especially wild ones!) but it was very hard to complain about these. 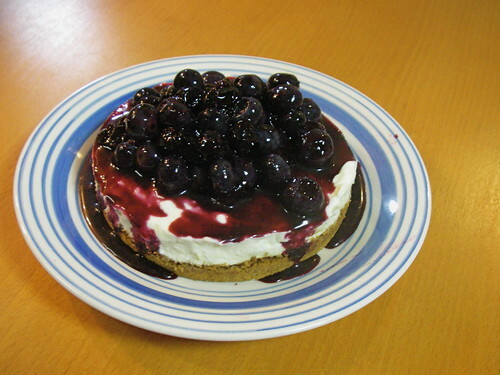 Here is what I made with the last of the blueberries: a no-bake cheesecake. It's made with mascarpone, cream cheese and yogurt, with a standard graham cracker crust and a simple topping of blueberries lightly cooked with sugar. So, so good! Oh, and that was a total lie up above- we ran out of Nerima berries before I could eat dairy (I've just started the gorging-on-dairy phase of an elimination diet to see if the dairy products I eat effects Shuma), so I had to buy more blueberries at Costco. But I fully meant to make this with our freshly picked berries, and I will someday. I will also work on presentation, but it's only my second time making (and liking) cheesecake and there no complaints. One look at the cheesecake, and I'd say it was worth all the picking - even at 8 bucks a pound. 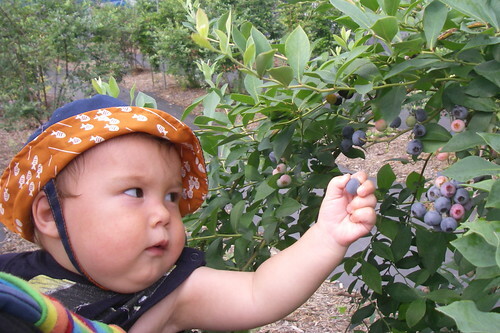 I didn't know they had self-serve fruit picking in Japan. I kinda wish I had done it now. 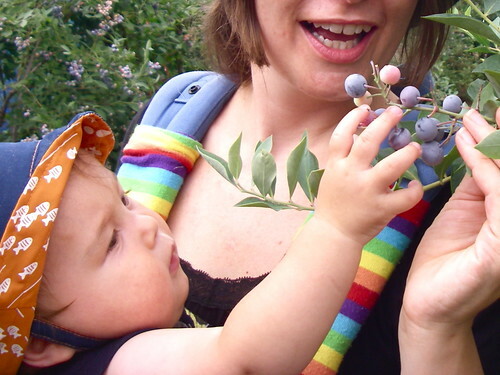 I took my little girl blueberry picking for the first time a few weeks ago too! I made a blueberry smoothie and blueberry muffins but they weren't good looking enough for a photo. your cake looks fab! Yumm blue berries! And you cheese cake looks really good. Can you share the recipe?